Rank: #4 out of 109. Arm's Reach Cambria is a very popular option at the top of the price range. 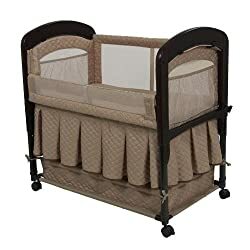 It's in the top 3 bestselling bassinets and has quite a few popular alternatives in the same price range, such as Arm's Cambria Co Sleeper or Halo Rocking DreamNest . Arm's Reach Cambria is $138.99 more expensive than the average bassinet ($105).